Ships today if you order in the next 2 hours 49 minutes. 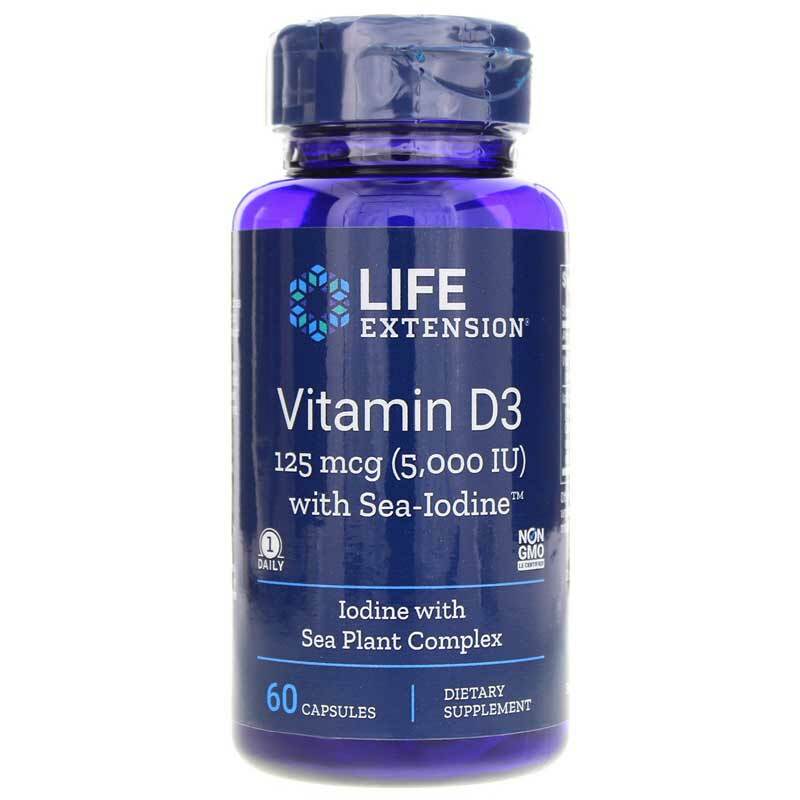 Vitamin D3 5000 IU with Sea Iodine from Life Extension combines two ingredients that are important to our health but which are deficient in many of our diets. Your body requires Vitamin D3 to form and maintain bones and muscles, as well as to improve balance. Vitamin D3 also plays a role in immune system health. It is not just your body that requires vitamin D; the probiotic bacteria in your intestines do, too, and they play a role in protecting you from disease. Americans have been cutting back on their table salt consumption for decades, for positive reasons. However, they may have also been unwittingly lowering their iodine intake to unhealthy levels. This is because table iodine, a health promoting trace element, is added to most table salt products. You require iodine to ensure your thyroid is functioning healthily. Your thyroid releases critical hormones your body uses to help regulate its metabolic processes. Your body uses thyroid hormones to help your body produce energy, regulate temperatures, and maintain the health of practically every organ, tissue and cell in your body. The sea-iodine included in this formula uses standardized extracts harvested from a blend of marine algae from the pristine waters of Iceland and Nova Scotia. To use as a dietary supplement, you can take one capsule daily, or as recommended by a healthcare practitioner. This formula is best taken with fat-containing, low fiber meals. Other Ingredients: microcrystalline cellulose, vegetable cellulose (capsule), maltodextrin, modified food starch, silica, stearic acid. Non-GMO. Due to the source of the kelp, this product may contain fish and shellfish. Adults: Take one capsule daily, or as recommended by a healthcare practitioner. 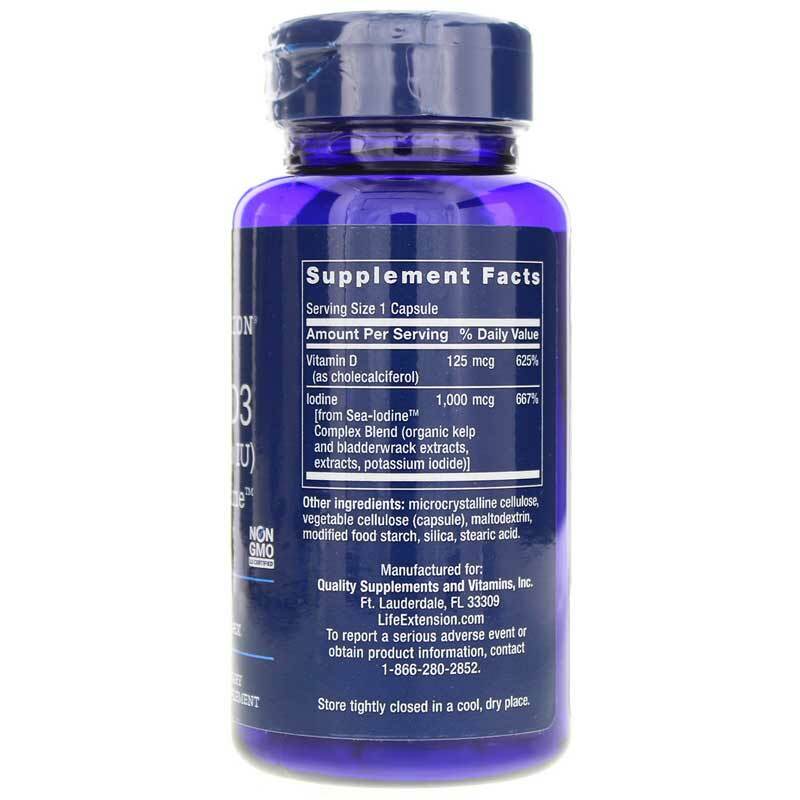 This product is best utilized when taken with fat-containing, low fiber meals. Individuals consuming more than 2,000 IU/day of vitamin D (from diet and supplements) should periodically obtain a serum 25-hydroxy vitamin D measurement. Do not exceed 10,000 IU per day unless recommended by your doctor. Vitamin D supplementation is not recommended for individuals with high blood calcium levels. If you have a thyroid condition or are taking antithyroid medications, do not use without consulting your healthcare practitioner. 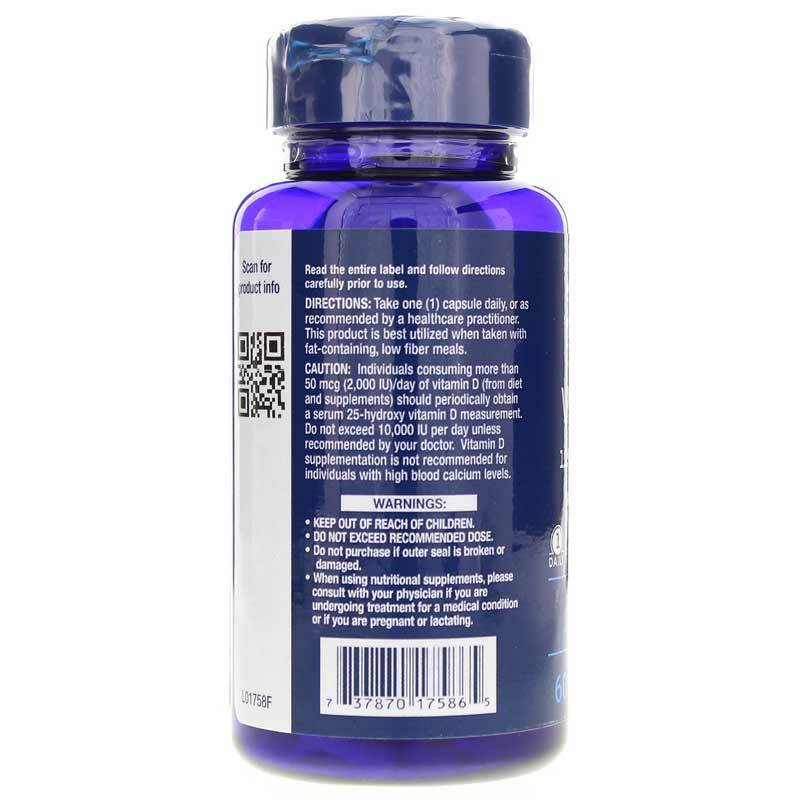 As with any dietary supplement, consult your healthcare practitioner before using this product, especially if you are pregnant, nursing, anticipate surgery, take medication on a regular basis or are otherwise under medical supervision. Keep out of the reach of children.